Digital transformation in business has introduced a seemingly endless variety of tools and techniques to get ahead of the competition. Many successful organizations now analyze the data generated by business activities and use the resulting insights to inform critical business decisions. Learn what important factors to consider when building your own BI and analytics strategy to empower your enterprise. 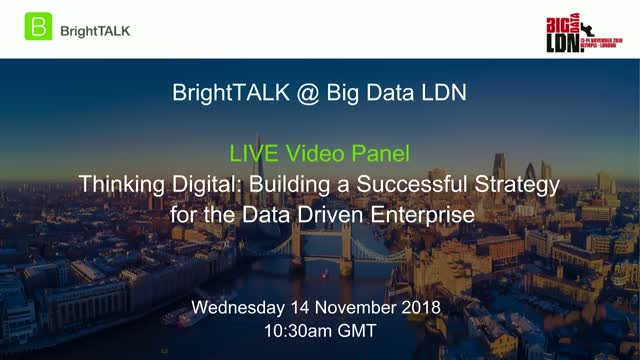 Tune in for this informative discussion where Tim and Gerard discuss the ‘Three C’s’ that they see as crucial points to consider in delivering big data success, as viewed from client side data leadership and from a data platform provider. Join this exciting session to hear from Michael O'Connell, Chief Analytics Officer at TIBCO Software, about the latest developments in analytics for the enterprise. Have your questions answered LIVE by Michael and get his take on how analytics and big data have revolutionized the way a number of industries make critical business decisions! Michael O'Connell is the Chief Analytics Officer at TIBCO Software, developing analytic solutions across a number of industries including Financial Services, Energy, Life Sciences, Consumer Goods & Retail, and Telco, Media & Networks. He has been working on statistical software applications for the past 20 years, and has published more than 50 papers and several software packages on statistical methods. Michael did his Ph.D. work in Statistics at North Carolina State University and is Adjunct Professor Statistics in the department.